I finally got it as I sewed the frame for the “Out of the Ashes” Show in 2004 that this painting is about my croning! For a long time I saw this as the Allies chopping back my head so I could be more in touch with my body. The spirit of Kali – She Who Knows When To Cut – had turned up again. And that is one of the stories. 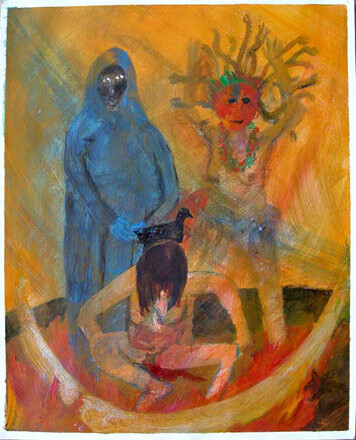 But now I also see these two as crones waiting for me to emerge from my menstrual years. A cutting of a different sort. This painting was done when I was still bleeding, when I couldn’t really comprehend any other way of being without that odd mix of messy pain and the glory of fertility and motherhood. As usual, both are true. There I crouch, pushing myself up from the ground, cradled by the moon, wanting to speak of my experiences. Originally it was called Phoenix II – blood as purifying fire I guess. The Black Madonna, here looking very Arabic and mysterious, is revered in Catholic churches both in South America and around the Mediterranean. She is yet another remnant of the ancient African Mother Goddess who appeared in my very first Allies painting. Her blue hands are folded…. or is she holding the duck above my head? Duck as cleaver? That silly duck just wouldn’t go away, as hard as I tried to paint it out or turn it into something more glamorous like Raven or Hawk. In case I think I’m in control of what I’m painting! A Hopi Kachina dances next to her as Kali. She is also Medusa with her snake hair. 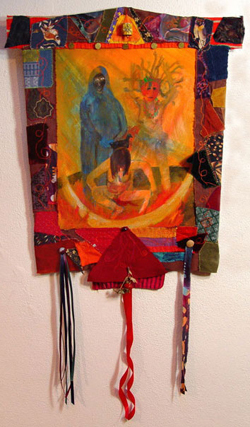 As to the frame – I’d been working all that year on crazy quilt pieces and got the urge to use them as a frame. The left side was one I’d already made. The other sides were put together for this. Many of the patches have special meaning for me mostly about family ties (lots of stories here). Towards the end I worried that it was “too much.” But then I realized it is like a Tibetan tanka. And I thought about how the Hopi are related in mysterious ways to the Tibetans and it all seemed apt. Written for Out of the Ashes Show, North County Rec Center, January 2004. This painting is not for sale.